STAY: What made our trip feel truly authentic was our accommodations. In Havana, there are residences called casa particulares (think AirBnb meets hostel) – beautiful homes where you can rent a private room, but have access to the entire residence. Casa Obispo, located in the heart of Old Havana, is owned by husband and wife duo Leo and Milagro. Not only were they the perfect hosts, showing us all the hot spots on a printed map (no google maps in this hood), but they quickly became our trusted friends and made us feel right at home. This place came highly recommended by a friend, and now I pass this gem on to all of you –> Casa Obispo (reservations can be booked ahead of time online). PLAY: If my instagram feed hasn’t given it away already, my favorite thing to do on our trip was to wander the streets of Havana with camera in hand! This place is a photographer’s paradise. Many of the locals were extremely friendly and always ready to pose for the camera. The old American cars of the 1950s were scattered all over the streets of Havana. It felt like a scene from a movie. You can take a 1 hour convertible tour of Havana via one of these fabulous rides. Best advice is to go in person vs booking online to save yourself some coin. If you’re looking for a night out on the town, Casa de la Musica is one of Cuba’s most popular nightclubs. Now when I say night club, I bet you’re all thinking the regular DJ, bright lights, bumpin’ dance floor. Guess again. We walked into a scene straight out of something I imagine my parents boast about when they talk of their discotheque days of the 70s. Round tables spanned the entire “club”, and drinks could be ordered to your table while you watched a live band and singers perform on a stage at the front of the hall. As the night goes on, the crowd gets up to dance in front of the stage, and it becomes a party, one that arguably rivals some in the East village of Manhattan. Need a fresh breath from the city? We took a detour to Valle de Vinales – a lush mountain range located just a couple hours outside old Havana. Here you can take a tour on horseback and learn about how the famous cuban cigars are made, how cuban coffee is mastered, and even salsa dance with some of the locals. I would say this is a must for anyone traveling to Cuba. Not only is it magically photogenic, but it felt amazing to get out amidst nature and experience a side of Cuba that is off the beaten path. 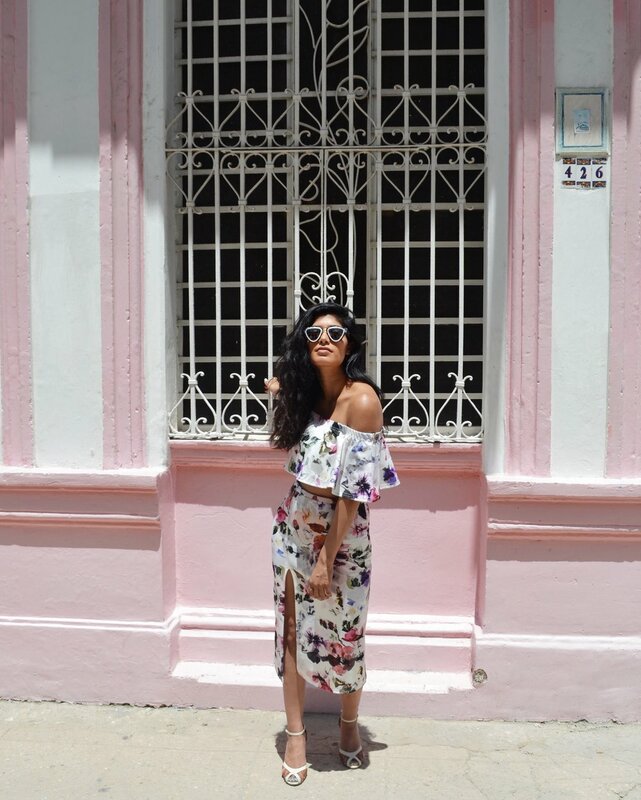 EAT: Famous for their daiquiries, and commonly known as a favorite hangout spot of Ernest Hemingway’s in Havana, Cafe Floradita was the place that became a daily staple on our trip. Check it out for yourself, and thank me later. One of the best meals we had was at Habana 61, known for their seafood dishes. It was a cuban feast with a modern flair. I highly recommend the ceviche and the shrimp criolla (Mmmmm! I’m salivating at the thought). Known for housing Beyonce, Rihanna and Madonna on their Cuban escapes, Hotel Sarratoga not only boasts a beautiful lobby that will become the backdrop for a impromptu photoshoot, but also serves up some great food. Feeling bougie? I would highly recommend visiting Hotel Nacional de Cuba, even just for a meal. This historic hotel backs on to the water and has a resort feel. We spent an afternoon having lunch on the water, and chatted over coffee on the main garden, until we were chased out by the resident peacock. Yes, you read that right. A peacock. She was beautiful… until she ate all our cookies (we weren’t even mad). 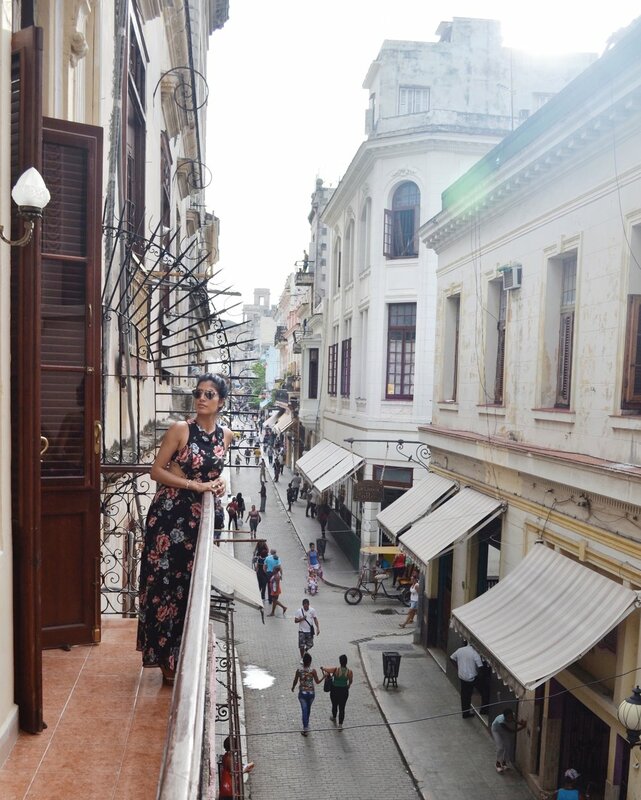 Cuba is such a beautiful country, and I hope I have the opportunity to visit again soon!